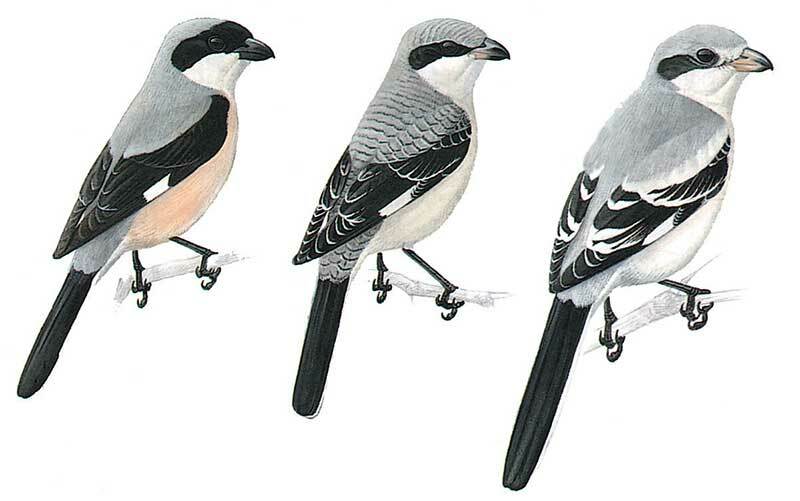 It resembles Southern Grey Shrike, but smaller with stubbier bill, longer wings with long primary projection and shorter, less graduated tail. The white wing panel is confined to primaries. Adult forehead is extensively black, and without the white supercilium(it exists in some Southern Grey Shrikes), the bluish grey upper parts lack white on shoulders (sometimes shows faintly) and pinkish white underparts. First winter birds and juveniles lack black forehead, have paler bill and the upper parts are grey brown finely barred darker (in juvenile) with paler tips to wing coverts and flight feathers. Underparts are creamy white, sometimes faintly barred. Can be confused with Southern Grey. Perches prominently on top of bush, tree or wire.